Skittles changes its site to give the floor to those who love the brand and want to talk about it. 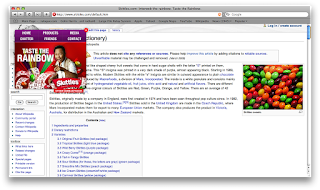 The homepage opens into the Skittles Wikipedia entry. Chatter tab leads viewers to the Twitter stream about Skittles. Media section does the job with various brand videos and pictures. Product links are there if you want to look through. The widget-like site navigator sends visitors to Facebook with the 'friends' tab. The design concept gives visitors the feeling that they are in absolute control of finding the information that matters and enables them to get in touch with others who share their passion for the product. The other interesting thing to note here is that Skittles is not referring people to the brand's own Twitter account or a Wiki page mocked up by professionals. This is the stream of information one would find if they were to look up the brand on Twitter and on Wkipedia. The concept is flexible enough to deliver brand messaging while embracing authentic online word of mouth and fans. I was deeply saddened to read today's news. 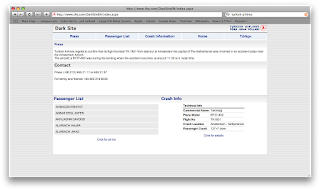 A Turkish Airline flight crashed near the Amsterdam airport. Nine people, including the pilots, died and 50 people are wounded. The aircraft's photos show the vehicle literally divided into several pieces. It is amazing that anyone came out alive. Turkish Airlines brings me home to Istanbul twice a year. I witness first-hand what a top-notch crew it has. They are courteous, responsive and able. The seasoned pilots, like the one who was flying passengers to Amsterdam, usually have an army background. Not to make light of the topic, but I have been more shaken by NY cabs than by landings to the Istanbul Airport. They're that good. Turkish Airlines' online response to this unfortunate event deserves a nod of approval. When I read the news this morning on one of the leading national papers Milliyet, the news report was followed by a candid blog entry by a pilot who is the head of the Aviation Association. He was urging readers who were commenting on the incident not to speculate and wait to hear the facts from the investigation. I turned to the company's Web site and found that they had already pushed up their dark site in multiple languages. Here are clips from their homepage and crisis section. You'll see that the dark site is complemented by a hotline and has sections pertaining to the flight, the accident and passenger list. Information is up to date. 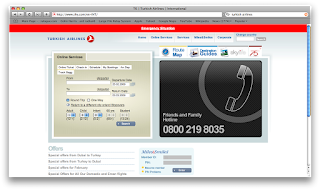 Turkish Airlines is not on Twitter, but its Facebook fans are doing the talking. The airline's employees have set up numerous fan pages and groups on the social networking site. You can recognize them from the icons they carry on their profiles: the airline logo with a black ribbon. It is hard to talk about online reputation when people have lost their lives as a result of an accident. It will be interesting to watch the online crowds' reactions as we hear more details about what happened exactly. Frankly I am comfortable with the idea that a site might own the personal information I post on their area. When I update my Facebook account, I am aware that I am sending information to the 200+ friends I have listed. I realize they can write back, forward and copy and paste that information. This is the duality of social media: You're doing something private in a very public space. It's best to be aware of this and get used to it as the way things are and will be as the Web evolves. I don't think one would even need to wait for Facebook to aggregate data or cull through profile areas. Your friends could very well be spreading your information - online and offline. Post with 'this' in mind. This is not Facebook's first attempt (or incident) trying to make use of the tremendous amount of user data that accumulates on the site. Facebook is looking for another way to make money from the site besides advertising. It's sitting on a gold mine. If users would understand the full set of ramifications of how their information would/could be used and opted-in to share or sell their information, then there would be new business models emerging from social networks. Take a look at this interview between SAP's Steve Mann and Prof. Sinan Aral from MIT and NYU. Aral makes the very good point that understanding audience's demographic profiles is not enough. Companies can be a lot more effective in their communications if they understand their audiences' networks. In other words, who you know, where and how you know them gives marketers better information about you then just your age, gender and location. There is an old saying in Turkish: 'Tell me who your friends are and I'll tell you who you are.' I guess it boils down to that. The Whaleman Foundation is an oceanic research, preservation and production non-profit that aims to protect whales and dolphins and their natural habitats. The organization is featured on the cause-related social networking site SocialVibe, where members match corporate sponsors with causes to raise funds. The organization just passed its $25,000 mark. I got an email from SocialVibe on Wednesday. The amount of money raised seems to have gone up even more since then. Whaleman is over $28,000 with more than 75,000 signatures for its petition. The goal is to reach 1,000,000 petitions in the next 115 days. Actress Pannettiere will deliver the online petition and signatures to the International Whaling Commission in June 2009. The comments from members who are trying to raise money for the cause and signing the petition suggest that Whaleman might reach the tipping point in the next week or so. Seeing the campaign's success makes people want to join and help push the limits, reach goals. The combination of cause-related marketing and social media is a pretty powerful. The site organizes the information and coaches people through each step of the effort. Users don't have to pay a penny out of their pocket. They just need to bring their passion to the click. To help the cause through SocialVibe, click here.